On July 7, 1983, an 11-year-old American girl from Manchester, Maine began a two-week tour of the Soviet Union at the invitation of Yuri Andropov after she wrote the Soviet leader a letter expressing concern about the possibility of a nuclear war. The winsome little girl gave the Soviets a rare look at Americans that wasn’t menacing, and Americans got a peek inside the usually off-limits Soviet Union. Samantha Smith explained what set off such an extraordinary chain of events in her book, Journey to the Soviet Union. Actually, the whole thing started when I asked my mother if there was going to be a war … I asked my mother who would start a war and why. She showed me a news magazine with a story about America and Russia, one that had a picture of the new Russian leader, Yuri Andropov, on the cover. We read it together. It seemed that the people in both Russia and America were worried that the other country would start a nuclear war. It all seemed so dumb to me … I told Mom that she should write to Mr. Andropov to find out who was causing all the trouble. She said, “Why don’t you write to him?” So I did. Incredibly, Andropov personally replied to Samantha’s letter, reassuring her that his country only wanted peace and mutual understanding with America, and they harbored no ill will toward her country. He ended the letter by extending an invitation for the young girl to come visit the Soviet Union that summer so she could see the country for herself. As soon as Samantha and her parents accepted Andropov’s invitation, letters poured in from all over the U.S., mostly in support of the trip to the U.S.S.R. However, there were many who were critical of the visit, accusing the Soviets of using the child as a propaganda tool. Perhaps – but Andropov had been upfront about wanting to improve relations with the West, and this was a perfect opportunity to erase some negative misconceptions Americans had about the Soviet Union. 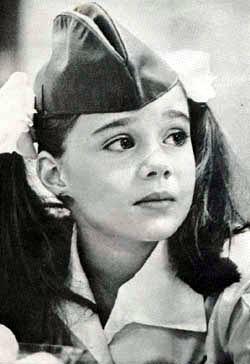 Everyone in the Soviet Union who has known Samantha Smith will forever remember the image of the American girl who, like millions of Soviet young men and women, dreamt about peace, and about friendship between the peoples of the United States and the Soviet Union.